A prolific and much-performed composer in Germany and his native Austria during the first part of his career, Gál reached the UK as a refugee following the Anschluss. His name became indelibly associated with Edinburgh University, where he taught for many years. He continued to compose unceasingly but his reputation as a composer did not really transfer to the UK. For many he remained an academic and a writer on music, roles he filled very effectively. By the time I attended Edinburgh University (1971-5) Gál was in complete retirement, though he was often to be seen in the Music Faculty Library and at the Reid Concerts. A quiet, reserved figure, he kept himself very much to himself. I personally had no direct contact with him and I doubt if any of my contemporaries did either. Just two occasions stick in my mind. The first was during the “Dallapiccola week”. The Italian composer Luigi Dallapiccola was visiting Edinburgh to receive an honorary doctorate and a Reid concert was dedicated entirely to his music. During the interval he was introduced to Hans Gál. The reader must try to imagine the scene. Both were rather small, frail men with white hair brushed straight back. Both had a decided stoop and, when speaking to someone, tended to lean even further towards their interlocutor, peering earnestly through thick glasses. Dallapiccola was actually 14 years younger than Gál, but he had aged less gracefully and the two might have been taken for twins. The reader should see in his mind’s eye the human arch created as the two men leant towards each other, each wearing his most earnest expression. It is fortunate they did not have curly hair or Lewis Carroll’s incident of the two footmen might not have been avoided. And my other memory is of the première of this Fourth Symphony, which the composer conducted at a Reid Concert in 1975. Having thought of Gál as just someone you saw around, I found him unexpectedly impressive on the rostrum. In his 85th year his movements were small but clear and he exuded a quiet authority. The Reid Orchestra clearly loved him, and I never heard them play better in my four years of attendance. As for the music, the 1970s were cruel years for all but a particular type of contemporary music. The personal brand of post-dodecaphony essayed by the then Reid Professor, Kenneth Leighton, was about as conservative as you could go without being laughed at. To us young bloods and blades it seemed that Gál was just reliving a style – late Richard Strauss – that had passed its sell-by date even in his youth. “Practically all straight out of [R. Strauss’s] Capriccio” was one comment. The fact that the performance took place at all – I heard nothing else by Gál in those four years – was seen as an indulgent gesture to an old man who had done sterling work for the University in former years. I, at least, recognized the skill with which it had been put together, but I don’t think any of us thought we’d ever hear it again. Nowadays we take a more pluralistic view. Composers tend to be judged on the strength of what they are aiming to do rather than sheer conformity with the dictates of the avant-garde. Composers who were once dismissed because they were writing romantic symphonies while Stravinsky and Schoenberg were undermining the foundations of music as it was then conceived, are now assessed on whether the romantic symphony is a good one or not. Readers who regularly visit this site will know that I have been a particular advocate of some of these “behind-the-times” composers, so I should be the last person to apply theorems to Hans Gál. And yet this symphony worries me, rather in the same way that George Lloyd worries me. I think it is perfectly possible to write music that is melodic, harmonic and formally laid out in a recognizably traditional way, but which somehow, subtly, nevertheless belongs to its times. It was once said of Edmund Rubbra that, if his music doesn’t belong to our own times, it couldn’t have been written in any other times. Maybe I should get to know more Gál, starting with his earlier works. As far as this symphony is concerned, time really does seem to have stopped for Gál in the 1930s. I leave readers to decide whether this matters. They will certainly find a skilfully assembled work. Whether they will find the themes actually memorable I am not sure – I experienced none of the half-familiarity you can find when rehearing a piece you first heard 35-plus years ago. Nor am I sure whether any great depths will emerge beneath the pleasant surface. But if you like late Strauss, give it a try. The performance seems excellent. The Schumann goes very spiritedly too, with real conviction and plenty of dynamic shading. Tempi are brisk in the faster movements, the “Adagio espressivo” quite grave and broad. There’s a little more portamento from the violins in this movement than we usually hear today, but not enough to worry you if you don’t like it. What I do find is that the lively acoustic – I think it must be a small, quite reverberant hall – creates overall a slightly wearing effect given Schumann’s obsessive doublings. Almost as if the idea had been to recreate the sound of the Reid Orchestra playing in the Reid Concert Hall. Gál’s more transparent textures bloom in such an acoustic, maybe Schumann would have benefited from more space. 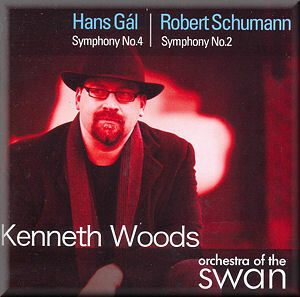 There seems little point in making comparisons with other recordings of the Schumann. If you’re collecting Schumann symphonies and couldn’t care less about Gál, there are plenty of versions as good or better that come with more Schumann. And if you want to investigate Gál, wouldn’t you want more of him? No doubt this pairing would make a nice concert, but records aren’t concerts.